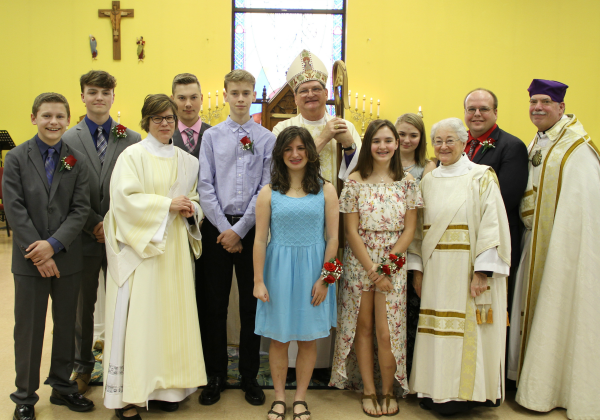 Congratulations to the Confirmation Class of 2018. What a wonderful celebration of Confirmation with Bishop Stokes, confirmands and their families/friends on April 15! A full church, lots of music, each member of the class involved in some aspect of the service: even the Lord’s Prayer was written by one of our young people. Congratulations and Blessings on our class: Elijah Byrnes, Andrew Clark, Joshua Eib, Francesca Fusco, Elizabeth Mendocino, Haley Nieroda, Deklin Smith and Jason Ferguson.